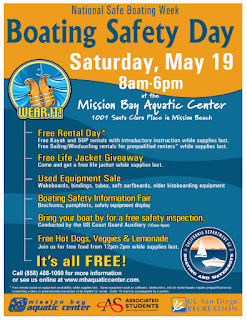 Join us on May 19th to celebrate the kick off of National Safe Boating Week. We will be giving away free life jackets (while supplies last), free hot dogs, and best of all- FREE RENTALS*! That's right, you can rent a stand up paddleboard or kayak without prior experience (we'll give you a quick free lesson), or a sailboat or windsurfer for qualified renters who have completed an MBAC class or orientation check off on that piece of equipment. We will also be holding our annual used equipment sale where you can purchase deeply discounted used wakeboards, surfboards, O'Neill wetsuits and more! You can also pick up materials about keeping safe while boating or even have your boat inspected by a US Coast Guard Auxilary safety officer before kicking off another boating season. 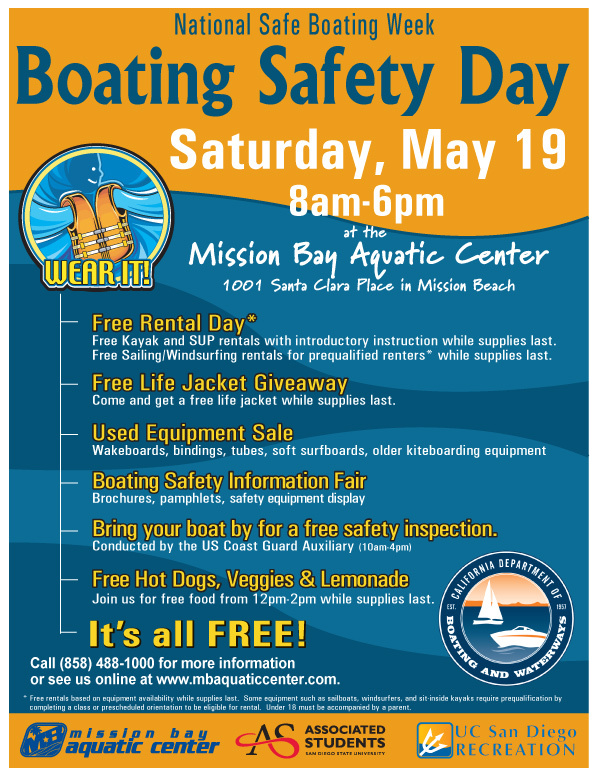 Take advantage of the opportunity to kick off a safe boating season at MBAC.